Hornady Custom is a new breed of ammunition that has bridged the gap on all sides of the handgun bullet equation. It is so accurate and reliable in guns that it has seen widespread adoption on the competitive shooting scene; while simultaneously providing incredible stopping power and deep penetration. Normally it’s hard to find a single load that optimizes on multiple levels; Hornady seems to have found the sweet spot across their entire line of custom rounds. This .357 Sig ammunition is a fast, deep penetrating round that offers excellent ballistics and ensures your self defense and carry weapons don’t have to do extra work to stop the threat. It features the XTP bullet by Hornady, an “Extreme Terminal” hollow point that is equally adept in the field against animals in handgun calibers as it is in self defense scenarios. Because of its impeccable design characteristics and essentially unmatched quality control and uniformity, they not only promise amazing accuracy, but actually deliver on it. 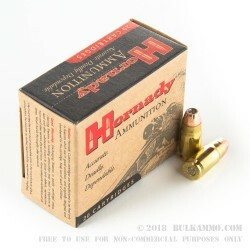 Reliable feeding and consistent accuracy as well as proven stopping power in the form of unique expansion to about 1.5 times the diameter of the original projectile; Hornady Custom Handgun ammunition is the real deal. 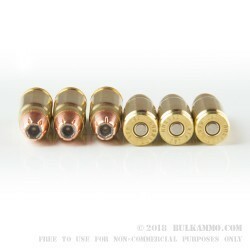 Q: can .357 SIG Ammo be used in a 357 mag Taurus Revolvers ? A: Hello Paul, Unfortunately no, you cannot use .357 Sig ammo in a .357 Magnum revolver. 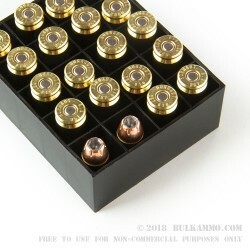 You would need .357 Magnum ammo for a .357 Magnum firearm.